All those 8 excruciating hours at work, all the networking, all the socializing, you suffer through all of it just to make it to that long snooze under your warm comforter. There’s nothing like the feeling of being draped in a soft, fluffy comforter to ease away your worries and unburden your mind. Most of us believe that we have to spend big bucks for such therapeutic treatment. Not anymore. Because we selected the 10 best down comforters for money. These bring you the luxurious feeling that your body deserves. And these use safe design practices which help you stay healthy throughout their use. We have already written a complete guide about Best Down Comforter Covers. What factors does the price of down comforters depend on? Are quality down comforters always expensive? Which are the best down comforters for money? Duck down: Duck down is easily available as a by-product from food industry. This is plucked from ducks meant for the industry. Duck down is averagely fluffy so it’s more reasonably priced than goose down. Goose down: Goose down comforters are more commonly found in Europe. In general it is fluffier than the duck down although insulation capabilities are similar or slightly better than duck down. They are pricier than duck down comforters. Down Alternative: The market is flooded with down alternative comforters. These are the most affordable of the lot although insulation properties may differ. 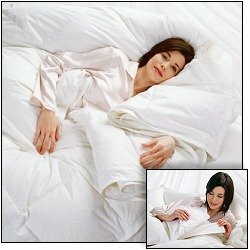 We have a different post on down alternative comforters. Down is the inner, softer layer of feather on a bird’s body. It has special insulating properties that cannot be rivaled by the exterior feathers. It is also lighter than feathers at the same insulation power. So down comforters are preferred for warmth. But almost none of the comforters have pure down filling. Some feathers are always packed with down, so look for high down percentage in the construction. Fill power: The warmth provided by a down comforter also depends on its fill power. This indicates the quality of down used. The higher the fill power, the more air one ounce of down can trap and the warmer it is. The average fill power is 450-500. 550-650 fill power is considered above average. 700 and above fill power is excellent for down comforters. Shell: The fabric of the shell of the down comforter is usually made of cotton. Check the thread count of this fabric. At 180+ thread count(TC) the fabric weave is tight enough to keep the down inside. This way the comforter doesn’t lose its filling and those with down allergy will remain healthy. 250+ thread count is excellent for down comforter shells. Sewn-through: In this type of construction, pockets are created by sewing through the shell and trapping the down between the cross-stitch. However, the lines through which the stitches go remain colder than the pockets because there’s no down to insulate there. Sewn-through comforters are affordable. Baffle Box: In this type of construction the down is trapped inside cuboidal pockets inside the comforter. There’s fabric stitched at 90° to the surface of the comforter pushing the down filling into small 6-sided boxes. Such comforters are fluffier than sewn-through construction. And they are warmer at the border of these pockets compared to sewn-through comforters. Baffle-box is the pricier option. Karo step design: This allows the down to move inside the comforter. You can spread the down evenly or focus it at the point where you need more warmth. Not necessarily. If you live in subtropical climates where comforter is only to keep you cozy and safe from monsters at night, you can go for low fill-power, high thread count comforter. For colder climates, go for high fill-power down comforters with average thread count. Slip them inside a duvet cover if the shell is not soft enough. Choose between baffle-box and sewn-through construction based on the warmth you require. Based on requirements, you can compromise on any one of the factors to fit the right down comforter in your budget. Make sure to fluff your comforters regularly and put them out in the sun periodically. Warmth: We checked the fill power and the amount of filling for the warmth of the comforter. The fill power was checked to be higher than average(450-550) and fill amount to be more than we stipulated for the sizes in the previous sections. We also looked at the construction and checked which areas were left vulnerable for the cold to seep into. For the price, we ensured they have evenly distributed their warming capability. We also picked some light comforters for subtropical climates. Feel: Comforter is like a security blanket for adults. You need to feel like you are being protected from the cold cold world. We looked for the plush feeling that really completes our bedding in any climate. The fill should be evenly distributed and should feel plush in all regions. Durability: Affordable down comforters may look plush initially. But we checked from various user accounts whether they hold their form over time. It will be a shame if the comforter flattens over time and feels no better than a blanket. Down shedding is another issue we prevented from tainting this list. Shell: We checked the shell of the best down comforters for money. The look, feel and breathability of the shell determines whether you need a duvet cover for it or not. A cover is additional expense and requires cleaning and drying. We tried to pick the ones with reasonably good quality shells. Price: Budget is an important consideration here. Most people with lower budgets often go for down alternatives. But we bring you the goodness of down at an agreeable price. The Egyptian Bedding Siberian Goose Down comforter checks all the boxes we listed for the best down comforters. Premium down, high fill power, sufficient fill amount, high thread count, it has all of it. The same comforter is available with different thread count too and in different sizes. All the top-notch features are wrapped in a very reasonable price-point. There’s literally nothing to complain about here. It’s a no-brainer for the best down comforters for money list. The Egyptian Bedding down comforter has a 100% filling of Siberian goose down. This down is fluffier and warmer than the usual duck down you get at this price. This is 750 fill power down which helps keep you warm through the winters as well. The box construction ensures that heat is retained at all parts of your body covered by this comforter. This King size bedding measures 106” x 90”. This size contains a whopping 70 ounces of down filling. Even for the colder climates, this will suffice. The Queen size is 90” x 90”. This down comforter has a 600 Thread Count cotton shell. Shells with higher thread counts are also available with the same filling. But this is breathable and doesn’t make you sweat in the summer. The sides of the shell are double-knit in a slightly different pattern. This seals the sides against any damage from grazing the floor of your bedroom. There are loops at the corners and the middle of the edges where you can latch on the duvet cover. This affordable down comforter is hypoallergenic. It is machine-washable too. It fluffs right back up when put into the machine at a low temperature. It does not need to be washed before the first use. There’s no chemical smell to it. It might be a little compressed upon arrival. It fluffs up into shape in a few hours. The Egyptian Bedding Siberian goose down is an all-season comforter. It can go from cool summer to moderate winters. The amount of fill gives it a full plush feel. This makes it heavier than the Hungarian goose down comforter from the same company. In spite of the high amount of down, it’s not very heavy. It’s easy to move around. The 600TC shell is well-ventilated. It allows you to remain sweat-free at higher temperatures without letting the goose down out. Some of the down sheds, but it’s really rare. It retains its loft with continuous maintenance as mentioned by the manufacturer. They back it up with 1-year warranty. The down doesn’t move out from the baffle boxes. The stitching holds. The Puredown All Season comforter is your savior, come spring or summer. This is a highly affordable piece of bedding. It’s lightweight yet warm nature helps you cozy up in light to moderate winters. The construction is robust and highly unlikely to tear away anytime soon. The manufacturer backs up the comforter with a 30-day trial period. 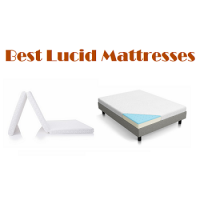 The choice of sizes and high fill power locks away its top place in the best pillows for money list. The Puredown All Season down comforter is stuffed up to 75% with pure white duck down. The construction is hypoallergenic and helps sensitive people enjoy the warmth. There are three sizes in this comforter. The Twin size measures 68” x 88” and has 28 ounces of 600 fill power down. The Queen size measures 88” x 88” and has 36 ounces of the same down. The King size is 104” x 88” and has 42 ounces of this down. All are lightweight and decently thin for regular use. This affordable down comforter has a 233 thread count cotton shell. This crispy fabric keeps the down locked inside the comforter. They have used box stitching to avoid clumping of down. The fill remains distributed evenly throughout the length and the width. The edges have been done in pipe design to lend extra protection in these sensitive areas. The manufacturer recommends that you only dry-clean this product to prolong its life. There are four tabs at the corners of this down comforter to safely secure a duvet cover. It is hypoallergenic and resistant to mold, mildew, bacteria and dust mites. The comforter arrives packed tightly. You have to give it a few hours and some manual fluffing to inflate properly. There might be some chemical smell as well which will air out simultaneously. The Puredown All Season comforter lives up to its name. It has high quality 600 fill power down which can easily keep you warm. But it’s lightweight and not extensively fluffy. In the cool evenings, it keeps your tootsies warm without being overbearingly hot. We like how they have balanced the weight against the warmth. There’s a faint rustling sound from it initially. The crisp shell will soon lose its stiffness and be quiet like normal soft cotton. For the price, this comforter bangs big. There were no complaints of down leakage and it remains fluffy as when originally bought with the usual maintenance. The DreamTek lightweight down comforter is the epitome of versatility. This piece of bedding with its crafty snap system is perfect for the temperate climates standalone. It’s one of those comforters that don’t get clammy. But it has the ability to reform itself for the harsh winters when combined with other DreamTek comforters. It can even solve the struggles of couples where one is a warm sleeper and other freezes in all temperatures. That kind of talent for pouring oil over troubles waters brings it a place in the best down comforters for the money list. The DreamTek lightweight down comforter is a sleek and classy duck down comforter. It is 600+ fill power down. It comes in three sizes. The Queen size measures 88” x 94” and packs 16 ounces of down. The win size measures 63” x 94” and packs 12 ounces of down. This may seem like an insufficient quantity but that’s what makes it usable in summers and moderate climates. The filling is completely down, no feathers. As a result, its highly breathable. The innovative snap system of this down comforter allows you to attach a similar DreamTek comforter over one and stack them for the brutal winters. You can attach a King size with another King for total warmth. Or if one of the sleepers is a warm sleeper and another is a cool sleeper, attach a Twin size comforter to the latter’s side. This way they remain warm and the warm sleeper doesn’t get clammy. Apart from the snaps, there are tabs to attach duvet cover. The shell of this affordable down comforter is 100% sateen cotton. Its 235TC build is hypoallergenic and prevents down seepage. It has a nice feel to it so you might not want to put a duvet cover. The comforter has a sewn-through construction which again helps air circulation. This is one of the rare comforters that are designated machine-washable. But use low temperature while washing and drying. A single DreamTek Lightweight down comforter is designed for the hot and moderate climates. It is well-ventilated, easy to move and provides only cozy warmth. It doesn’t feel sultry like other high fill comforters. The Smart snap system is a savior when you encounter tough winters. The scope of use of the DreamTek comforters is really wide. The sateen cover crinkles quite a bit initially. It softens down after a wash. The snaps also stay out of the way when you sleep. It fluffs up to its natural shape within a few days of arrival. It’s not as plush as the goose down. But warm sleepers will enjoy how it feels. Egyptian Bedding is rocking the down comforter game. So here’s another one of their unbelievable offering. This Hungarian goose down comforter is for those cool nights when the weather is still pleasant not harsh. The shell itself is also high thread count which keeps the down from coming loose. The beautifully knit design and other touches that make it convenient to use all make solid case for its place in the best down comforters for money list. The Egyptian Bedding down comforter is filled with high quality Hungarian goose down. Not only is it better than duck down, it’s actually a great quality goose down as well. This comforter carries 50 ounces of this down at a fill power of 750+. The Queen size measures 90” x 90” whereas the King size is 106” x 90”. Both are suitable for the standard sizes of beds. This affordable down comforter uses baffle box construction. This keep it evenly heated even at the edges of the pockets where down is stored. It also keeps the down from escaping out of the comforter. The uniform distribution of down doesn’t require much effort. We would fluff them regularly in the winter and just one or twice in the summer. The edges of the duvet are sealed in double stitching. This seals the edges against any probably tear or leakage. The shell of this budget-oriented down comforter is 800TC Egyptian cotton. It is also available in 1000TC and 1200TC shells. Higher the thread count, the tighter the weave and the softer the fabric feels. But high thread count also keeps the shell from breathing well. For year-round use, we prefer the 800TC version. There are loops on the edges of the comforter to secure duvet covers, should you decide to get one. The manufacturers suggest that this down comforter should be dry-cleaned. You can hand wash it with gentle detergent at your own risk. Be careful to buy from a trusted seller. Since this is such a killer deal, customers are often cheated with fake goods under it name. The Egyptian Bedding Hungarian goose down comforter is deliciously warm. The 800TC ensures you don’t sweat profusely under it. We suggest buying a cotton duvet as any other material will choke its air circulation. The shell does make a rustling sound when it’s new. This is because of its crispy new texture. After a wash its soft nature should start to show. This down comforter is lightweight. You don’t feel overwhelmed by the 50 ounce down. It can be used year-round based on the frequency of fluffing: regularly in winter and sporadically in summers. In piece received from the trusted seller, there’s no noticeable leakage of down. The Pacific Coast European down comforter impressed up with its exceptional value for money. This one meets all the requirements we had of a god down comforter. It goes above and beyond by being lightweight and easy maintenance. Pacific Coast has been known to make exceptionally durable comforters. This one joins their ranks. The impressive quality at such an affordable price deserves a place in our best down comforters for money list. The Pacific Coast European down comforter uses reputed Pyrenees down. The firm claims that this is 650 fill power HyperClean down. Its larger fluffier clusters will provide the warmth and rich feel we so enjoy. They have used the Baffle Box construction which uniformly distributes the down and effectively keeps it from piling. The Queen size measures 90” x 98”. It carries 34 ounces of the fill. We appreciate the extra 8 inches over the usual Queen size. This down comforter has a 100% Egyptian cotton shell. The 420 thread count is enough to create a barrier for the down but it allows air to circulate freely. Pacific Coast stipulates that the robust comforter needs only occasional cleaning every 3-5 years at a trusted dry-cleaner. This makes it easy to maintain. We would put a duvet cover over it for sanitary reasons. This affordable down comforter inflates to the full potential within a few days of arrival. There’s no foul smell in any piece of the merchandise. The Pacific Coast European down comforter is a truly serendipitous product. It has the soft, lush feel of a quality comforter. It is good for all-season use right up to the winters. It is designed to be properly ventialted. Its warmth never comes with sweltering heat. There’s no annoying odor or sound from it. All in all, it makes for a great sleeping experience. The performance lasts through many years with minimum maintenance efforts. The C&W Luxurious is a heavy duty goose down comforter for light to moderate winters. But it brings you the warmth without the side-effects of mugginess. It has the authentically fluffy feel to it which we usually see in much more expensive comforters. The high thread count shell keeps the air moving. This masterpiece deserves a place in the best down comforters for money list. 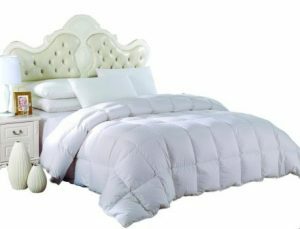 The C&W Luxurious down comforter uses 100% white goose down feather. This is 700+ fill power goose down spread across the length and breadth in a baffle box design. The baffle boxes keep the down from piling in one corner and distribute the warmth equally in all directions. The King size measures 104” x 90” with 60 ounces of the fill. The Queen size measures 94” x 90” with 55 ounces of the fill. This affordable comforter has a hypoallergenic 800 thread count cotton cover. The cover has a shiny finish that sheds off any animal hair, if you have a pet. The edges of the comforter have loops that can be used to tie on a duvet cover. It cannot be machine-washed. You have to take it to the dry-cleaner. Once you take it out from the pack, it takes some time to puff up. There might be some residual odor which airs out when you leave it in the open. The C&W Luxurious down comforter is a winter bedding. It has high fill power, high fill amount. Together these get your very warm in those excruciating winters. A duvet cover will go a long way in enhancing the heat. The comforter doesn’t get sultry unless you use it in humid summers. It has the uber-fluffy feel that most people crave for from their comforters-. Occasional shaking out will give you a durable performance. The Royal Hotel down comforter is a luxurious piece of bedding. As the name suggests, it gives you the hotel-like richness through your snooze-fest. The choices of size ensure its fit in with the décor. The high fill power keeps you warm through moderate winter. But it’s breathable enough to be comforting in the summer. The soft cotton shell plays a key role in this. This is undoubtedly one of the best down comforters for money. The Royal Hotel down comforter is stuffed with 100% goose down. It comes in three sizes. The Twin size is 68” x 90” with 28 ounces of 600+ fill power down. The Queen size is 90” x 90” has 30 ounces of the 600+ fill. The King size is 106” x 90” with 40 ounces of 650+ fill power down. Unlike other down comforters at its price, it does not use a blend with synthetic material here. This makes its lightweight while providing heavy duty warmth. 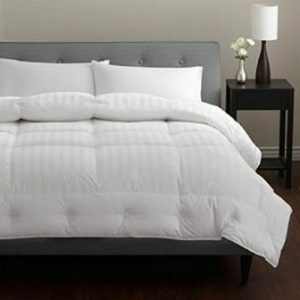 This affordable down comforter has a 300 thread count cotton shell. This cover is soft and airy. It allows air to circulate freely. The comforter uses box stitching which locks down the down well. You only see mild shedding in the original product. It arrives compression-packed. It takes 3-4 days for it to completely inflate. If that doesn’t happen, you can toss it in the dryer with a clean tennis ball for 20 mins. It fluffs the comforter to its full potential. We suggest exercising patience in this regard. The manufacturer recommends dry cleaning this down comforter. You can try washing it in the delicate cycle of the machine. That has worked for some people. It doesn’t have any tabs to slide a duvet cover. But we would use it with a cover to avoid soiling it with regular use. It’s very easy to handle the Royal Hotel Light down comforter. It’ not heavy but it’s warm for up to medium winters. The cotton cover breathes well. It doesn’t get hot or stuffy. It is fluffy because of the character of goose down. But you have to wait for it become truly plush. You might have some trouble tugging it because of the lack of duvet covers tabs though. 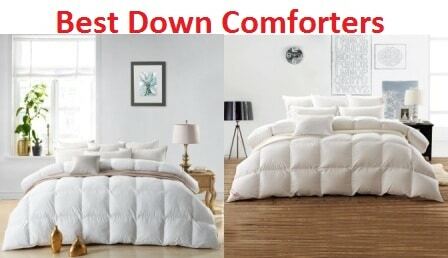 This down comforter seems to hold its initial richness even after dry cleaning/washing. If you treat it to a harsh cycle in the machine, the down will pile unevenly. We suggest shaking it out once in a while. The TopSleepy Luxurious goose down comforter is a summer and autumn bedding. This light bedding is perfect for all-year use. The simple stitching and design can be customized with a colorful duvet cover. The wide range of sizes helps with every bed size. The reasonable price ensures quality and durability while bringing relief to your pockets. This is a reliable product that made a wise choice to the best down comforters for money list. The TopSleepy Luxurious down comforter uses 50% quality goose down and 50% feather to keep your toes warm. It is available in four sizes. The Twin size is 68” x 88”. The Queen Size is 88” x 88”. The King size is 102” x 90” and the California King 106” x 90”. The goose down is of 500+ fill power. The King size carries 45 ounces of this filling. The box stitching pattern is evident from outside. It is not overtly fluffy. The fill and fill power are for moderate winters and other steamy seasons. This affordable down comforter has little ties on the edges which helps you secure the duvet cover. The shell is made of 100% cotton. At 300 thread count, it’s fairly breathable. It’s also hypoallergenic and soft for the skin. This comforter is machine-washable. But dry-cleaning will help in the longer run. It arrives flatter than expected. It fills out to full fluff in some time. Fluff it in the dryer at a low temperature if you can’t wait. It does not require constant fluffing to remain inflated after that. The TopSleepy Luxurious goose down comforter is an all-season bedding. Except for the most scathing winters, you can use it in any season. In winters you might want to layer it with a sheet inside. Duvet cover will go a long way in keeping this one clean. It is sleek and easy to move as opposed to the bulky plush comforters. But since this is goose down, it offers decent warmth. This down comforter is very very soft. We loved the feel of it for the mild climate. The rustling of the shell was on a non bothersome level. Some customers have complained of an odor when it arrives. The manufacturer recommends drying it out but if that’s the case, we recommend returning it and asking for a new piece from a proper seller. 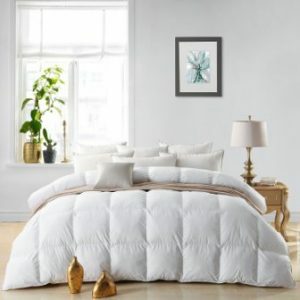 The Snowman white goose down comforter is meant for the cold sleepers. This bedding with its abundant down filling will encourage you to challenge the cold weather. The visually satisfying stitching looks glamorous in its ivory color. The choice of sizes means it will fit beds of standards sizes. This comforter sneaked right into our best down comforters for money list. The Snowman white goose down comforter contains a mixture of 90% 800 fill power white goose down and 10% goose down feathers. This is locked into baffle boxes which prevents down shedding. The baffles also facilitate the down to remain fluffy and spread the warmth throughout the comforter. It is available in three sizes. The King size is 106” x 90” and contains 65 ounces down. The Queen size is 90” x 90” and has 55 ounces fill. The Twin size is 68” x 90” has 45 ounces fill. This affordable down comforter has a 100% cotton cover. This is hypoallergenic and anti-dust mite. It has corner tabs to tie down the duvet covers. It is supposed to be dry-cleaned for the best results. The corners are done with special stitching so as to reinforce them. In spite of the high fill power and high fill amount the Snowman white goose down comforter is easy to lug around. It is very puffy and ensconces you in a cloud-like feeling. The consensus is that it’s warm. Given the fill power and amount, its more for the moderate to heavy winter climate. But by the nature of goose down, it’s pretty breathable and cold sleepers can use it in summer too. Add a little zing to your bedding with the striped Pacific Coast comforter. We already know they make highly durable products. This all-season lightweight comforter will help you snuggle up in the cold nights of summer to moderate winters. The construction is top-quality based on our checklist of good down comforters. It elegantly draws the curtain to best down comforters for money list. 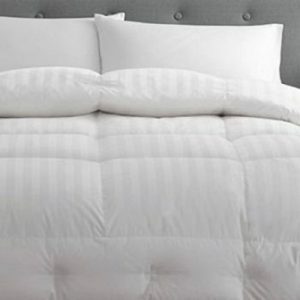 The Pacific Coast striped down comforter uses high-quality Pyrenees goose down. This Hyperclean goose down is known to be fluffy and breathable. The King size runs 108” x 98”. This is larger than most Californian King size comforters. It is filled with 40.5 ounces of 650 fill power down. The down is trapped in true baffle boxes. This keeps the down from lumping into one corner. And all parts of the comforter remain warm. The sides of this affordable down comforter are stitched with a piping which adds durability. These parts are sensitive to damage but piping avoids this. The shell is 500 thread count pure cotton. It has to be dry-cleaned. The Pacific Coast striped down comforter is a hot bedding. It can keep you cozy in medium to harsh winters. It might feel thin initially but once it fluffs out this thing gets warm! It feels luxurious. There’s no down shedding in spite of the abundant fill. It has no foul smells upon arrival.